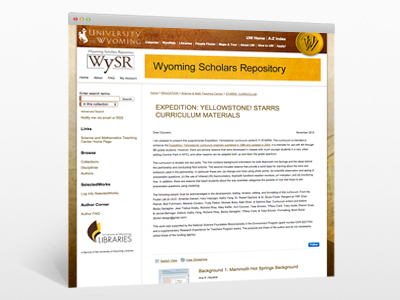 "Yellowstone Curriculum at the University of Wyoming"
This supplement for the "Expedition: Yellowstone!" field science curriculum, called "E:Y! STaRRS," is intended to enhance the curriculum originally published in 1989 and updated in 2004.